The long awaited quarter three and quarter four report for the Semi-Annual EmPOWER Program report has been released along with comments of the Public Service Commission staff. This report marks the end of 2016 for the EmPOWER Maryland program cycle (2015-2017), leaving one year remaining. The third and fourth quarters of 2016 - as well as the entire program year - brought mixed results across the utilities and their portfolios, but also produced the highest overall savings result of any program year since EmPOWER began. 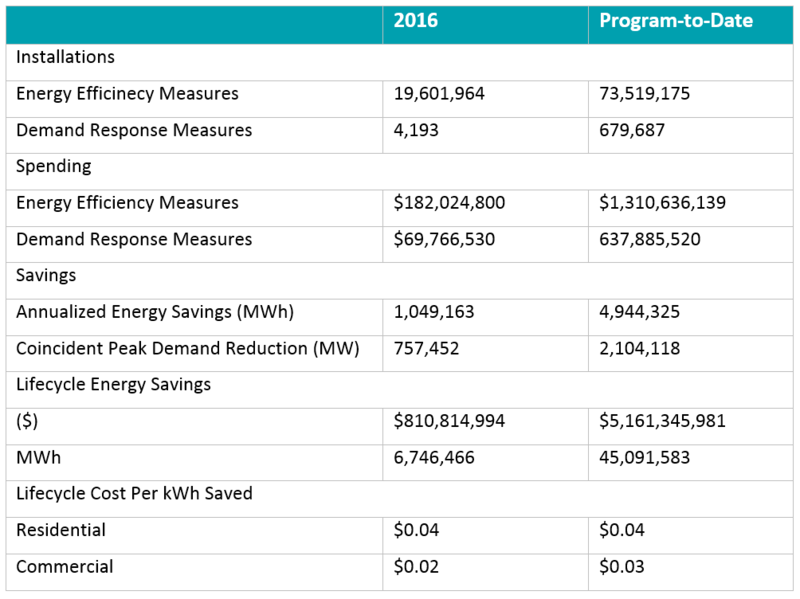 The following table from the EmPOWER Semi-Annual report also shows how the program has performed for energy efficiency and demand response measures. The Lifecycle Cost per Energy Savings provided is to be used as a simple proxy of cost-effectiveness as compared to current avoided costs to generate a kWh. It is not used as a replacement for cost-effectiveness analysis because it does not include other non-electricity impacts such as gas and water savings, or other participant costs. This report comes in a timely fashion as the EmPOWER bill was enacted into law April 5 without Governor Hogan’s signature. 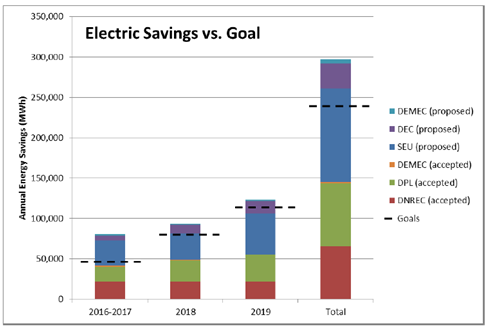 This bill codifies the two percent target of electric energy savings until 2024. Under this program, customers are charged a fee on utility bills. Utility companies use these fees for energy efficiency programs such as home energy check-ups, rebates, and bill credits for reducing electricity use and efficient appliances. In addition, SB 758 Income Tax Credit- Energy Storage Systems was signed into law May 4, 2017. This bill calls for a 30 percent tax credit for the deployment of energy storage technologies that runs from 2018 through 2022. The bill passed unanimously in the Senate and by 101-11 votes in the House. Maryland is the first in the nation to pass a storage tax credit. The bill establishes income tax credits for up to 30 percent of the total cost of energy storage installed at residences and businesses from 2018 through the end of 2022, with an annual overall cap of $750,000. The Reforming the Energy Vision (REV) proceedings continue with a recent publication of a draft New York REV Energy Efficiency Procurement and Market Report (see pdf pg. 88). This publication comes from the Energy Efficiency Procurement & Markets working group and addresses 1) sustainably procuring energy efficiency as a utility system resource, 2) the timing for implementation or testing, 3) whether a designated approach for energy efficiency procurement under the Clean Energy Standard or a distinct/compatible market is warranted, and 4) addressing underserved customer segments. 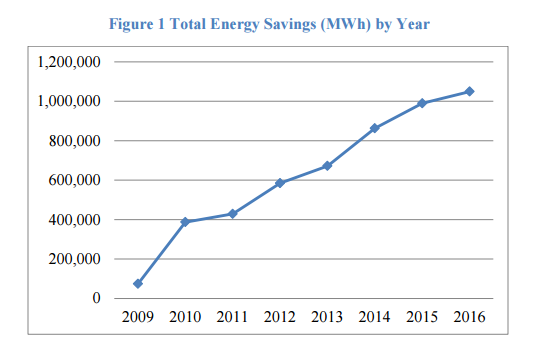 Energy efficiency is a major component needed to achieve New York State’s energy policy goals, including both a 40 percent reduction in greenhouse gas emissions from 1990 levels by 2030, and the cost-effective achievement of a 50 percent renewables goal by 2030. 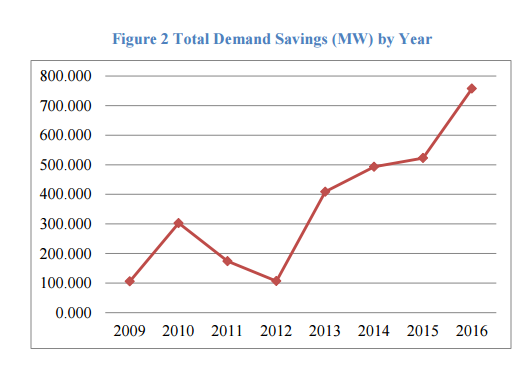 In order to achieve these aggressive goals, the Public Service Commission (PSC) has accentuated the need to leverage customer and private investment to produce greater energy efficiency savings than are realized under existing programs. On May 19, 2016, the PSC issued an Order Adopting a Ratemaking and Utility Revenue Model Policy Framework, which directed the Department of Public Service (DPS) to initiate a collaborative process to develop scorecard metrics and issue a progress report to the Commission by May 1, 2017. This progress report has been filed with the PSC. The report notes the DPS’s intent to use the individual earning adjustment mechanisms collaborative meetings and rate case processes as the venue to develop utility scorecard metrics for each utility. A collaborative approach is necessary to enable the development of a uniform list of metrics across utilities, which is significant given the wide range of metrics. On another note, New York Governor Cuomo nominated John Rhodes, CEO of NYSERDA to head the New York Public Service Commission. Governor Cuomo also announced $11 million in funding for 11 microgrid projects across the state, in support of the state carbon reduction goal. In addition to these microgrid projects, Con Edison has released RFPs for non-wires alternative projects Hudson and Columbus Circle. Rhode Island has taken a deep dive into cost-effectiveness and the utility framework. Docket 4600 was opened in 2016 to initiate a stakeholder process to “develop a report that will guide the PUC’s review of [National Grid’s] rate structure in future proceedings.” The final report was accepted by the PUC at an open meeting May 4, 2017. The report provides a cost-effectiveness framework specific to Rhode Island with over 50 drivers and a robust list of costs and benefits to consider by power system, customer, and societal categories. The report also presents a section on rate design and the necessity to account for policy goals in cost-effectiveness. The working group was able to come to consensus on each part of the report, except for whether the recommended opt-out time-vary-rate framework should be to a third party or to another rate within National Grid’s rate structure. The PUC recommends that the PUC open a formal grid modernization docket to investigate viable pathways and efficient levels of investment, specific to the Rhode Island system, to meet the goals outlined in the report. This investigation will also look into other statutory goals that apply to the PUC’s regulatory responsibilities, such as consideration of rate impacts over the short and long term and of rate stability. The PUC & Office of Energy Resources released a Notice of Inquiry into the Electric Utility Business Model and Request for Stakeholder Comment by May 19. This is a part of the Power Sector Transformation Initiative. The Vermont Senate voted May 4, 2017 to pass H.411, the appliance standards bill that backstops federal residential and C&I appliance standards if repealed and backstops the general service lighting standards. The governor is expected to sign it. This leadership action ensures the continued success appliance standards have had in achieving energy savings. Massachusetts Governor Charlie Baker announced six new clean energy and efficiency programs, making up the final component of the administration's $15 million Affordable Access to Clean and Efficient Energy (AACEE) Initiative. Here are the results from the final working group report. The six programs build upon the working group report. For example, the Department of Energy Resources’ (DOER) Green Communities Division will offer Affordable Access Regional Coordination (AARC) grants to Regional Planning Authorities and Councils of Government to build in-house expertise around energy efficiency and clean energy through programs that provide training, education, and coordination services to municipal or community organizations that support low income populations. DOER is also announcing the Zero-Energy Modular Affordable Housing Initiative (ZE-MAHI) grant program. On the utility side, the DPU authorized Eversource to shift consideration of key investments in grid modernization, energy storage, and infrastructure to enable electric vehicles from the grid modernization proceeding to the company’s general rate case. This shift will remove the requirement for cost-benefit analysis of the investments. Without the cost-benefit analysis, there is no measure as to how these investments advance the Department’s grid modernization objectives. In Delaware, the energy efficiency resource standard is currently voluntary until final implementation rules are established by the Delaware Public Service Commission. The two graphs below were presented to the Energy Efficiency Advisory Council. 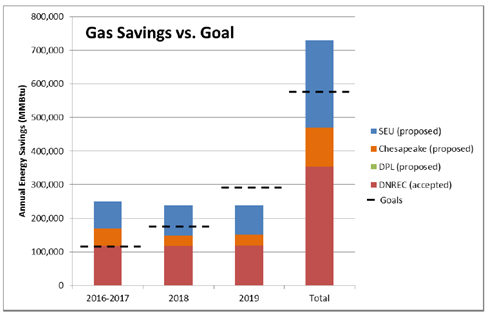 They show the planned energy efficiency program progress towards Delaware savings targets, whether proposed or accepted by EEAC. Energy efficiency resource standards (EERS) policies are pending in Delaware, but final targets have not yet been approved. There was an established EERS through 2015, but that legislation only covered through 2015. Down in our capital, Mayor Muriel Bowser announced she is planning to introduce legislation to establish a green bank in order to fund efficiency upgrades, add renewables, lower emissions and create jobs. D.C would be the first city to establish a green bank, although NY and CT already have similar financing authorities. The introduction of Green Bank legislation is part of the Bowser Administration’s continued efforts to make Washington, D.C. more resilient to the effects of climate change. The Federal Energy Regulatory Commission (FERC) recently held a technical conference to discuss regional wholesale markets in the northeast and the implications of state policies on a regional market place. There were three plausible outcomes of the session May 1-2. This included negotiated solutions (carbon pricing built off RGGI or creating a new market to add to the energy capacity market), litigation, or re-regulation of state power markets. The technical conference found consensus around the need for a price on carbon in the wholesale market. Sens. Jeff Merkley (D-Ore.), Bernie Sanders (I-Vt.) and Edward J. Markey (D-Mass.) introduced legislation that calls on the U.S. to transition off fossil fuels by 2050, hoping to spur action at the state and local level. It is called the 100×50 Act. It is promising to see a call to action at the state level.